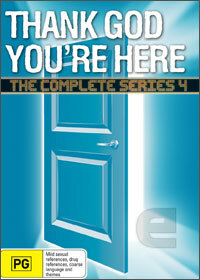 Thank God You’re Here returns to DVD with its fourth season, bringing with it another year of improvisational comedy based around a big blue door. Even though the show moved from Channel Ten to Seven this year, the premise remains intact, as does the talent. Shane Bourne remains host, Tom Gleisner is still the judge, and the performers are still a selection of Australia’s top comedic talent. So does the new series bring the laughs on DVD? Walk through the door and find out..
“Thank God You’re Here” gentle reader, and welcome to the review. We were just discussing whether the Logie winning and ratings success television show would continues to bring the laughs on a home theatre collection. Well the answer is yes and no. For those that have not seen the show, Thank God You’re Here is a game show of sorts, where four comedians will be thrust in situations where they must improvise the lines. These can range from a prisoner at a parole hearing to a late night talk show appearance of a gold digging fiancée. After the skit is over, judge Tom Gleisner will discuss what worked and what did not. The group will also take part in a pre recorded challenge, which is often shilling some bogus company or product, before the last group challenge where all four members are put in the same situation and must out improvise each other, before Gleisner decides the winner for the night. The problem with having them on DVD, and watching them all at once, is that the repetitive nature of the program starts to show, and it begins to wear a little thin. Viewers can easily pick out the formulaic parts and minor irritations begin to surface. Maybe it is just me but after hearing Gleisner mention how wonderful someone was or his attempts to “analyse” the comedy for the one hundredth time, it starts to grate. Also the situations start to feel too similar, but once again this is just a pratfall against watching every episode consecutively on DVD instead of the weekly televised instalments. For the most part the program itself is decent enough entertainment that sways from mildly amusing to amusing without ever incurring full blown belly laughs. The talent is fairly wide ranging, including Akmal Saleh, Merrick Watts, Carl Barron, Kate Langbroek, Hamish Blake and many more. As with all sketch comedy type shows, the segments are hit and miss stuff, this time depending solely on the charisma of the comedian doing the improvisation. It’s fun to see them come up with stuff so quickly except it’s never hilariously funny, and lots of times it’s quite predictable stuff. Thank God You’re Here is a show that is probably best left on television. It doesn’t really lend itself to repeated viewings, and its rigid formula starts to show the more you watch it. Add this to the fairly pointless and annoying Tom Gleisner, and only a small selection of laughs and there isn’t too much to recommend. The DVD edition looks fairly nice, but only includes a couple of extended sketches as part of its special features, so there is nothing extra to justify a purchase. The Australian public doesn’t seem to agree with me though, as they continue to lap it up. So if you are a fan of the show, I’m sure there is something here that is worthwhile. For people looking to try it for the first time, maybe catch it on TV first.